Wha what? I'm reviewing a grownup book? Um. Yes. And not just any book. A super awesome book. A book I've been waiting for for literally years. And it's a book I think y'all should all read. Now, let me preface this by saying that I don't know Rob. I've never met him, never talked to him, never emailed him. I've just been reading his blog for the past few years. And we blog readers know better than anyone how following someone's blog can make you feel like you know him. And like you know his punky, adorably irresistible daughter. This book is about one such punky, adorably irresistible daughter. And it's also about a father. And about a monster. The monster, in this case, is a congenital brain malformation called bilateral perisylvian polymicrogyria. It's an extremely rare disorder that results in Schuyler's inability to speak. So. Schuyler's got this monster, this brain thing that's keeping her from speaking. And this is a kid who's got a lot to say. 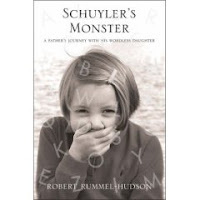 Rummel-Hudson chronicles his journey with his daughter from before she was born up until she's about seven. He describes the frustrating and devastating process of getting a correct diagnosis. At first doctors thought Schuyler might be deaf, then they thought she might have an autism spectrum disorder... It took years and endless evaluations to finally arrive at the correct diagnosis. And then it took years after that to finally get Schuyler the assistive technology and schooling that would help her do her best. It's a moving story about an unconquerable little girl. I loved it. But here's the thing... Yeah, I loved it. But I've been following Rob's blog for a long time. I knew a lot of the story already. I knew how it would turn out and I knew the basic plot points. I wonder how it will be for people who don't know what's coming next. Will it be even better because everything will be a surprise? Or did I get more out of it because I am already somewhat emotionally invested in Schuyler? You read it and then tell me. After you're done reading the book, do check out Fighting Monsters with Rubber Swords (Rob's blog). I especially recommend a series of "promo" videos done by Rob and his wife Julie. Here's one with Rob telling us what the book is about. I've just finished it myself. I see you're on Good Reads too.